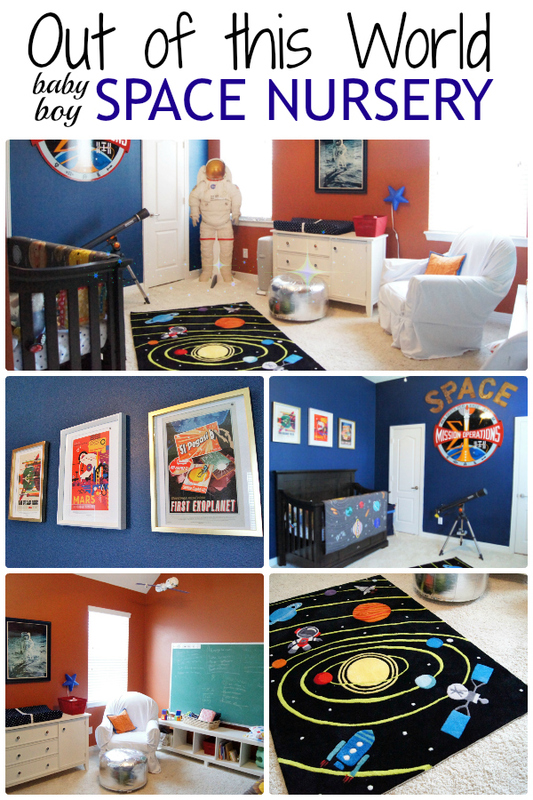 It took almost six months to finish, but Evan (our new addition) has the coolest baby boy outer space nursery on the planet. What do you expect from two parents who work in the space industry? 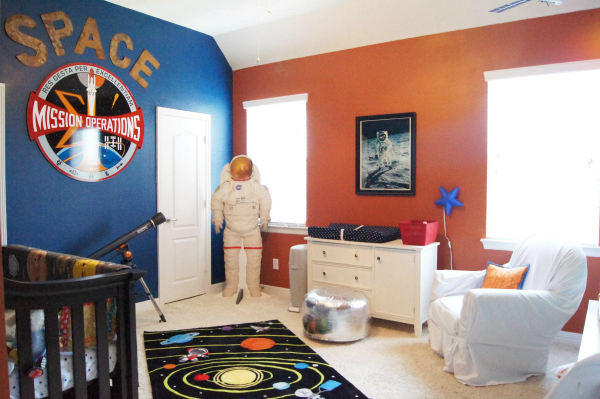 Sure, there are tons of themes for little boy’s rooms, but considering how much space-related items we have both accrued over the years, this just made sense. It gave us a great reason to clean out the attic and our offices. Also? Space rules. 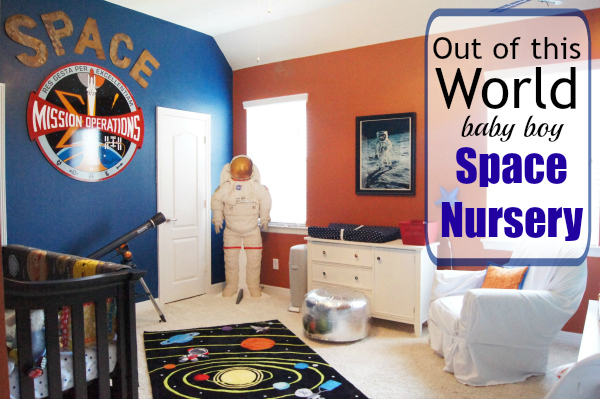 This whole nursery theme centered on the cute space blanket I found at the Land of Nod. Once I had that picked out, everything else fell into place. I didn’t really want everything to match perfectly and I think I did a pretty good job with that. Chuck did his part, too. 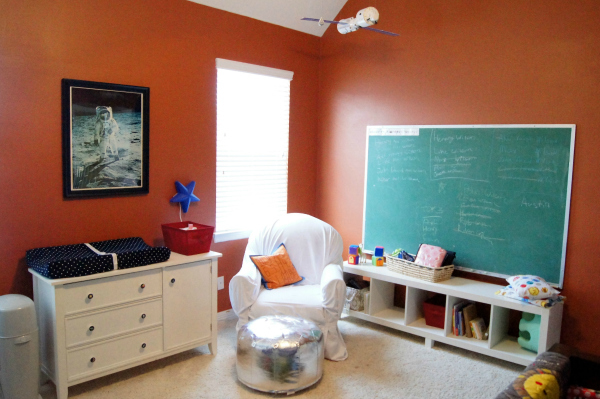 He painted the room since I was enormously pregnant the entire time we were putting this room together. As the resident room painter and certified control freak, this was PAINFUL for me. It was even more so when I saw that he had gotten orange paint in several large spots on the white shag carpet. Which he thought he could clean up with bleach… Bless his heart, as we say around these parts. Luckily, he found a carpet repair guy who cut some strips out of our hall linen closet and wove them into those spaces. 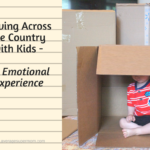 Just $175 to get that all squared away! 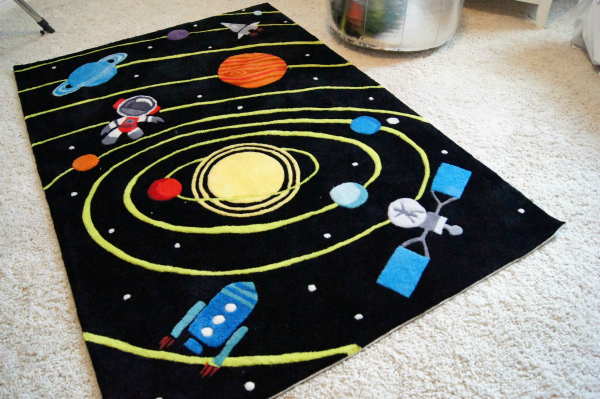 He also picked out the rug, which I hated at first. It has since grown on me and everyone who sees it just loves it. 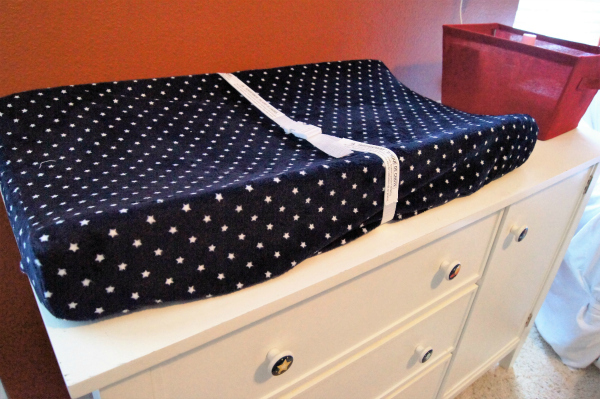 We even used it for Evan’s newborn photo shoot. My favorite additions are the cool things we had lying around our offices and the attic. The (almost) life size astronaut came from my office, as did the “SPACE” metal letters on the wall. Chuck had the Apollo 11 poster in his office and I found a cheap frame for it at Michael’s. 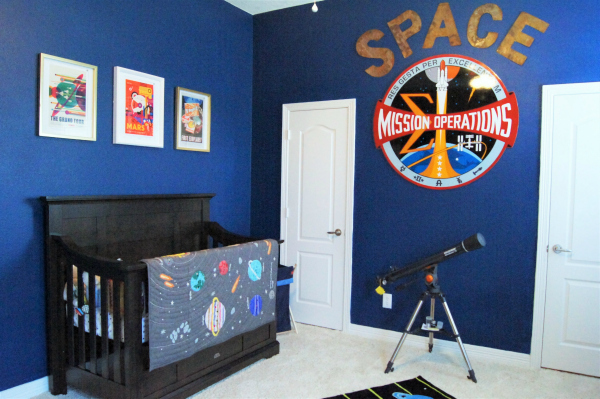 The large Mission Operations emblem came from NASA’s Mission Control. They changed the logo to remove the space shuttle recently and he had a few lying around at work. 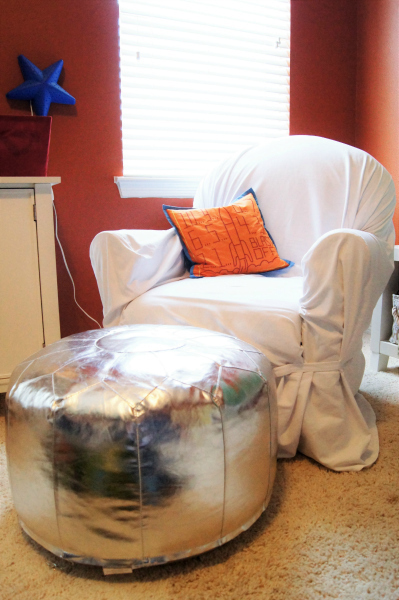 Other recycled items were the chair and the changing table which were both Ava’s. And if you’d like to pin this post, here is a nice, handy collage for you! 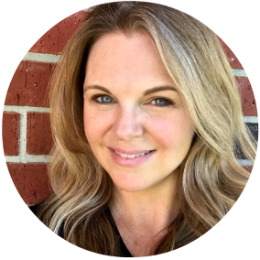 *Note – this post contains affiliate links and I may make a tiny bit of cash off of them. That cash will go to wine college funds for the kiddos.